Accumulation/Distribution is a momentum indicator that associates changes in price and volume. The indicator is based on the premise that the more volume that accompanies a price move, the more significant the price move. Accumulation/Distribution is really a variation of the more popular On Balance Volume indicator . Both of these indicators attempt to confirm changes in prices by comparing the volume associated with prices. Divergences between the Accumulation/Distribution and the security’s price imply a change is imminent. When a divergence does occur, prices usually change to confirm the Accumulation/Distribution. For example, if the indicator is moving up and the security’s price is going down, prices will probably reverse. 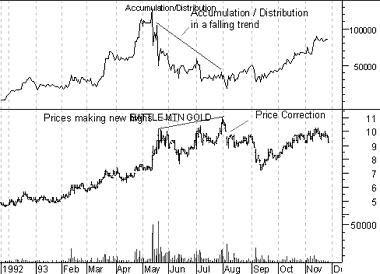 The following chart shows Battle Mountain Gold and its Accumulation/Distribution. Battle Mountain’s price diverged as it reached new highs in late July while the indicator was falling. Prices then corrected to confirm the indicator’s trend. A portion of each day’s volume is added or subtracted from a cumulative total. The nearer the closing price is to the high for the day, the more volume added to the cumulative total. The nearer the closing price is to the low for the day, the more volume subtracted from the cumulative total. If the close is exactly between the high and low prices, nothing is added to the cumulative total.